I have been working with those with BPD and BPD Loved Ones for over 15+ years now. Knowledge is power. Understanding matters. Knowing what you are dealing with when your adult-child has BPD and how to take care of yourself and other family members is of paramount importance and involves learning more about BPD but also specific coping skills and the limits that exist in what you can and cannot do and how to cope with that. You can read books on the subject of BPD and Loved Ones and I have written Ebooks For BPD Loved Ones and purchase and listen to Audio Programs I've recorded for BPD Loved Ones on this subject but it can also be even more helpful to speak to me as I am someone with a life time's experience with BPD on both sides of it. It is important to know that you need to learn the difference between rescuing and enabling, versus supporting, and trying to change someone who is not cooperating or able (right now) and how to radically accept and cope with the impact of being the parent of an adult-child with Borderline Personality. People with Borderline Personality are often unable to consistently cooperate or recognize the need they have for treatment. I can help you learn how to cope with your adult-child with BPD in ways that will help you to reduce your own suffering. A.J. 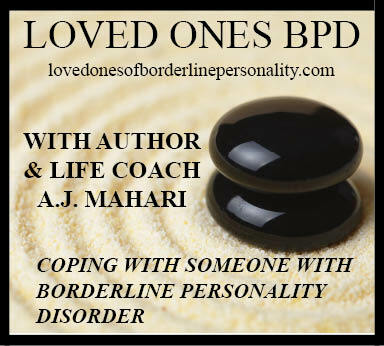 Mahari, with 15+ years experience in this field, offers her expert BPD Loved Ones Coaching to help you learn coping skills, understand more, and make much-needed choices in your life including implementing boundaries and learning what it means that you cannot rescue your adult-child with BPD. © A.J. Mahari, October 31, 2012 - All rights reserved.